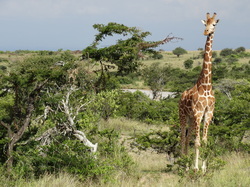 Populations of large mammalian herbivores and carnivores are in decline worldwide, but many African savannas are still home to a full suite of them. It is remarkable how little we know about the basic biology of these species, how they interact with each other, and how they interact with their landscape. Do elephants and giraffe eat the same plant species? Do zebras compete with the domestic cattle that human livelihoods depend upon? Better knowledge of these interactions - and how these interactions respond to perturbation - will improve our ability to predict and respond to conservation needs. Please see the page on our collaborative Project BASEPAIR. Species come and go, their abundances rise and fall, and their dynamic roles in ecological networks have effects that cascade through entire ecosystems. Many such changes - both recent and ancient - have produced the communities of plants and animals that we see today. As the climate changes and landscapes are altered, species will have to move, adapt, or face extinction. We ask questions about how all of this happens. 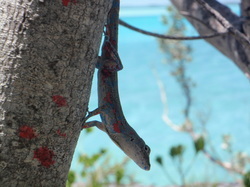 If predatory lizards invade a Caribbean island, can smaller lizard species coexist in the food web? Does the diversity of food resources determine whether wildlife compete with livestock in Kenya? Where deforestation alters the mountainous landscapes of Costa Rica, will populations of rare orchids survive? Do some species assemblages enable ecosystems to sequester more climate-changing carbon than others? Mechanistic answers to these questions matter to our efforts to protect species and the ecosystem services that they provide. How can we protect the diversity of life on earth if we know so little about it? Our work pushes the boundaries of DNA-based technologies to help illuminate hidden components of biodiversity. Projects in the lab use conservation genetics to track movements of rare and invasive species, DNA barcoding and metabarcoding to monitor species distributions and interactions, and genomic approaches to characterize the evolution and functional diversity of organisms. These approaches can be used almost anywhere, and we have used them to understand the ecology of microbiomes, megaherbivores, and humans in places that range from primary tropical rainforests to pastoral rangelands and urban ecosystems. Increasingly, we hope to blur the lines between the field and the lab by simplifying genomic workflows to enable their use on the front lines of ecology and conservation biology.